Yes, this is a recipe for North-of-the-Border, healthy, lean and delicious - Norwegian fish tacos with a South-of-the-Border twist. Place the ingredients for the marinate in a large bowl and mix before adding fish fillets. Marinate fillets 1 hour or more and strain. Pour 1 tablespoon olive oil into large pan and add strained ingredients. Saute until fish is flaky. Do not over cook. Fish requires very short cook time. Place the following ingredients in taco shells, corn or flour tortillas. Sauteed fish fillets, beans and vegetables. Jalapeno peppers for those who like it hot. Salsa, hot, medium or mild. And... Why shouldn't a meal be fun and easy? Place the above ingredients into colorful bowls and let your guests and family enjoy build their tasty, low calorie, and healthy Seafood Tacos. Olé! 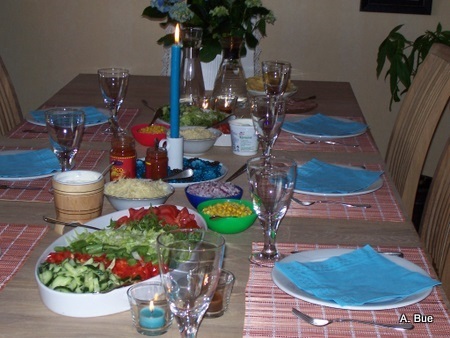 And...of course, if you are Norwegian, proper Etiquette requires that you set the table with a knife and a fork. See picture above.